Alice Through the Looking-Glass, and What Alice Found There by Lewis Carroll. Designed and Illustrated By Barry Moser. Published by Pennyroyal, University of California Press, 1983. First edition hardback with dustjacket. Barry Moser (born 1940) is an American illustrator, printer, painter, printmaker, designer, author, essayist, and teacher. He’s been involved in over 300 books, and this Alice won the National Book Award for design and illustration in 1983 and apparently prompted the poet John Ashbery to call Moser’s work “never less than dazzling.” The pictures are truly wonderful: dark and disturbing woodcuts. And there are plenty of them. The book also includes footnotes in rather fetching red ink, and several appendices including the Wasp in the Wig ‘lost chapter’. Bought at the Chelsea Antiquarian Book Fair from Jean Hedger (jean.hedger@virgin.net). 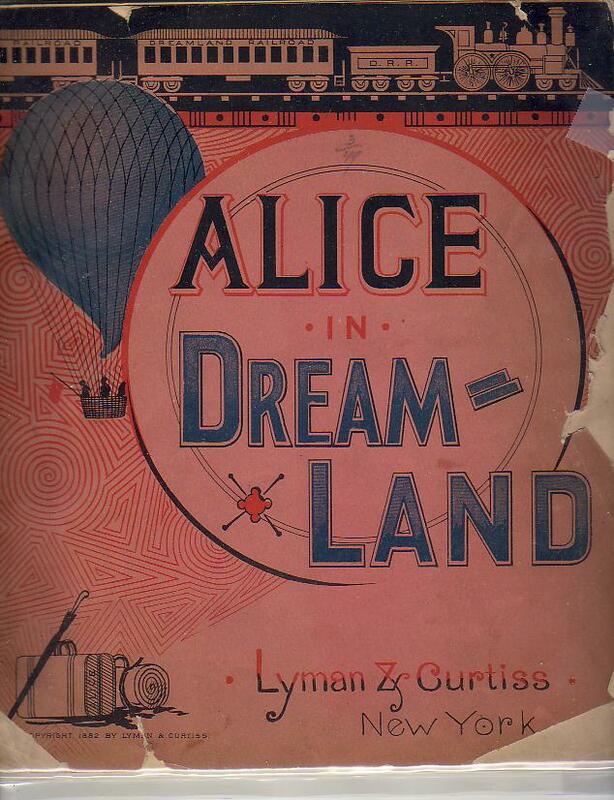 Alice in Dreamland by Seymour Lyman. Published by Lyman & Curtiss, 1882. There are fourteen pages within including six full page color plates (one double page) for this imaginative story in verse that takes Alice around the world. This title not in Lovett; not in Library of Congress; and not listed in oclc. In fact, lc only shows one entry for this publisher and it seems likely that the Seymour Lyman author is also the Lyman of the publisher. They also seemed to have published a few games around the same time (circa 1882) so probably they were a short-lived enterprise that did some interesting work and then went on with their lives? All in all, probably an unrecorded Alice parody that is really fun. Bought from Jo Ann Reisler Ltd via abebooks. Illustrated by Jill Thompson and Jenny Frison. Published by IDW Publishing, 2010. Hardback, ?1st edition? Both Alice books in a single volume, with internal illustrations by Jenny Frison, and front cover art by Jill Thompson. Jill Thompson is the most well-known, female comicbook artist working in the comics industry today. She graduated in 1987 from the American Academy of Art in Chicago and has been working non-stop as a cartoonist and illustrator ever since. She has risen to the top of the male-dominated field and has garnered acclaim for her work on WONDER WOMAN, SWAMP THING, BLACK ORCHID and the award winning title SANDMAN with Neil Gaiman. Jenny Frison is best known as a cover artist- they seem to have switched roles for this one. She has done covers for Angel and Spike comics. You can buy the artwork from this Alice (or just have a look) here. I do prefer the internal illustrations to the cover art- they’re softer and less sharply cartoony. I didn’t buy this when I first saw it on Amazon , as I wasn’t attracted by the cover. It wasn’t until I found it in Dave’s Comics in Brighton that I got a look inside and bought it.